We spent the first day of 2015 making footprints in the sand, chasing waves and collecting stones off the beach; coming away with at least a pocket full (or two) of special finds. 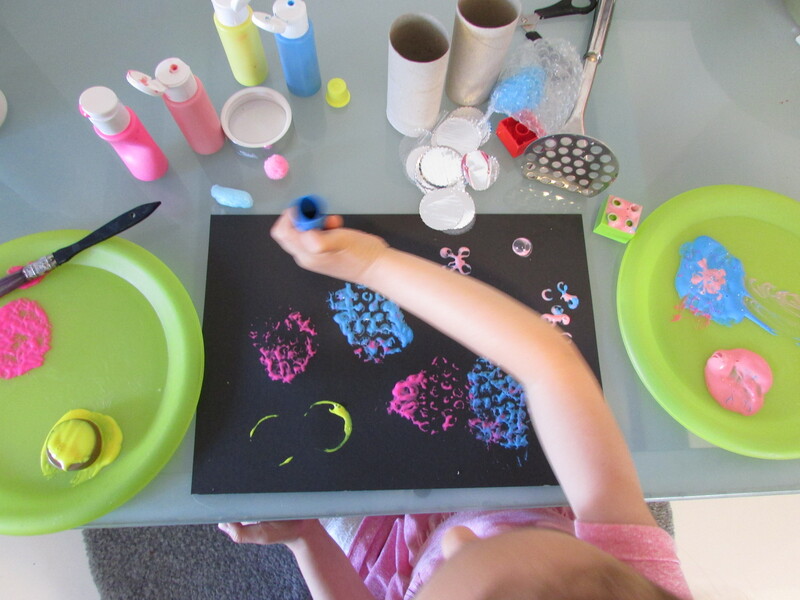 Within the mindset of ‘firsts’ for 2015, I was keen for our first craft of the year to be one the whole family could enjoy! 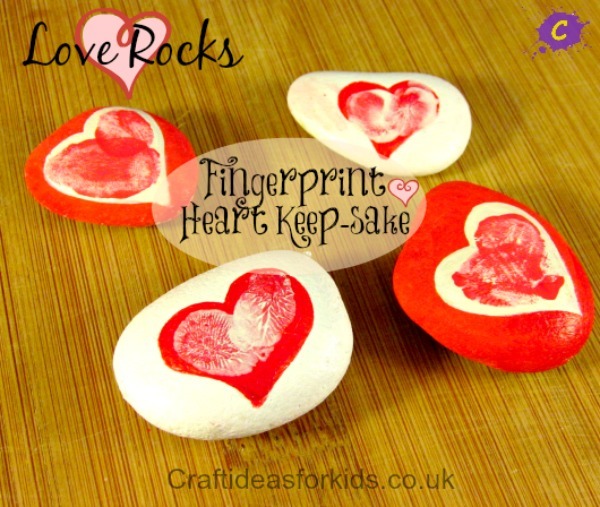 To create a little special something for us to look back on in years to come, as such, we used our beach stones to create these super cute Love Rocks: Fingerprint Heart Keep-Sakes. 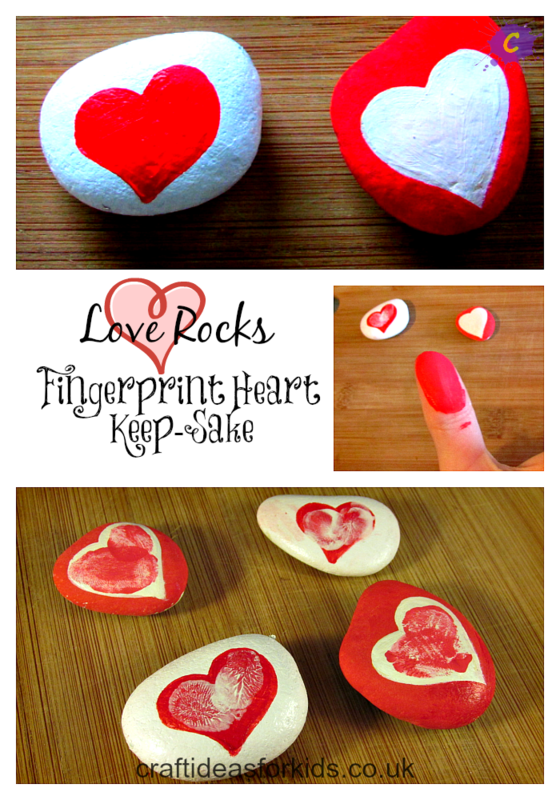 I love how our Love Rocks turned out and if you’re already thinking about Valentine’s Day, I reckon they would make perfect little gifts! 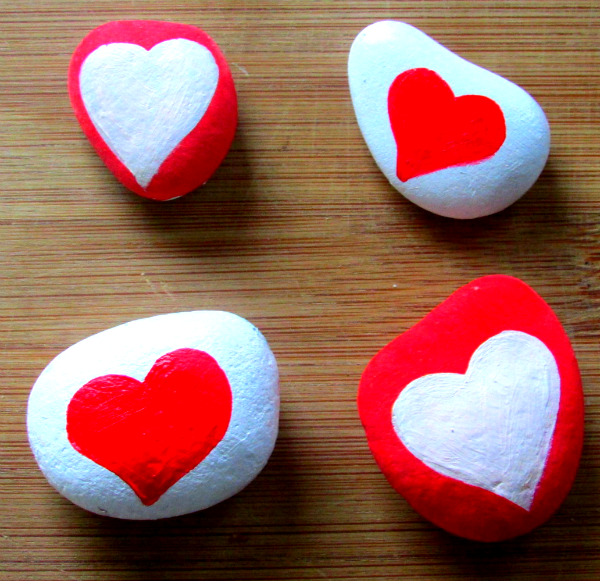 For this particular craft I decided to paint the hearts myself, opting for red and white acrylic paint. Acrylic paint is great for painting stones; it covers well and smoothly without having to apply too many layers of paint (I applied two coats). 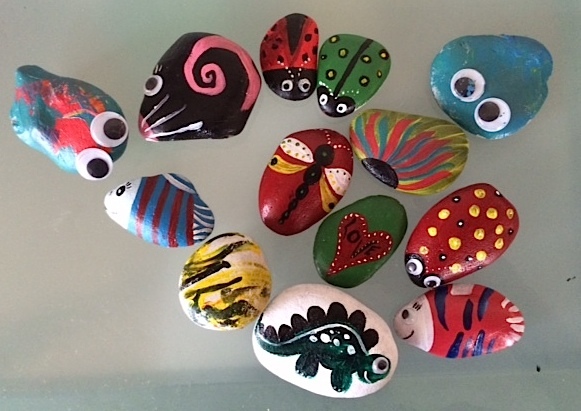 I painted a stone for each of us, ensuring the stones were proportionate to the size of our prints. Now it’s time for the Crafty Kids! Using an alternative colour to heart, simply dab a small amount of paint onto a thumb, ensuring good coverage. 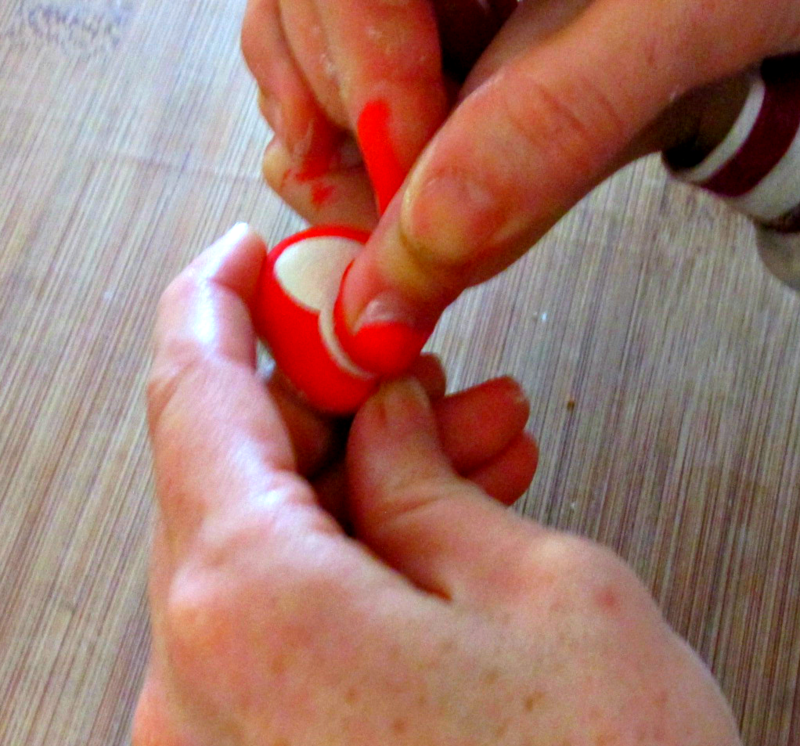 Next, firmly place the thumb onto one side of the heart, rocking the thumb a little to create a complete print. 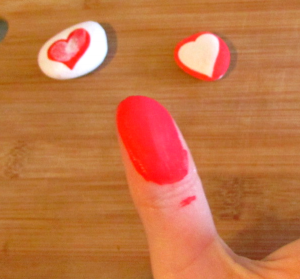 To complete the fingerprint heart, apply another thin layer of paint to a forefinger. 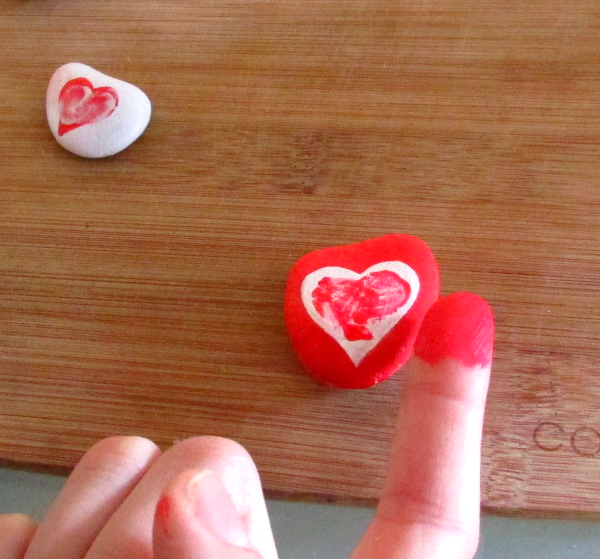 Place the finger onto the opposite side of the heart, pressing down nice and firmly. Like us, a Love Rock: Fingerprint Heart Keep-sake could be created for the all the family or maybe it could become a special gift from the kiddies on Valentine’s Day? Either way, it’s a great reason to head outside and enjoy some family time at the beach! 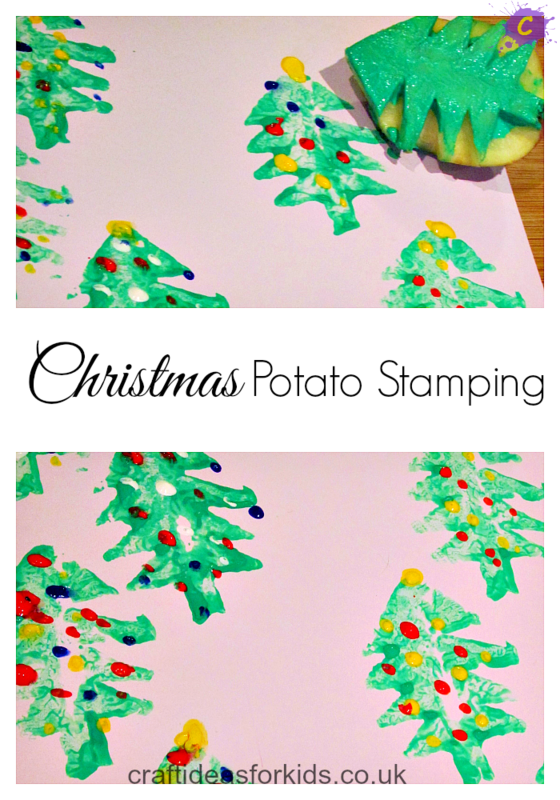 Ohhh who doesn’t remember potato stamping as a kid? It’s a classic craft; cheap and easy to set up too! 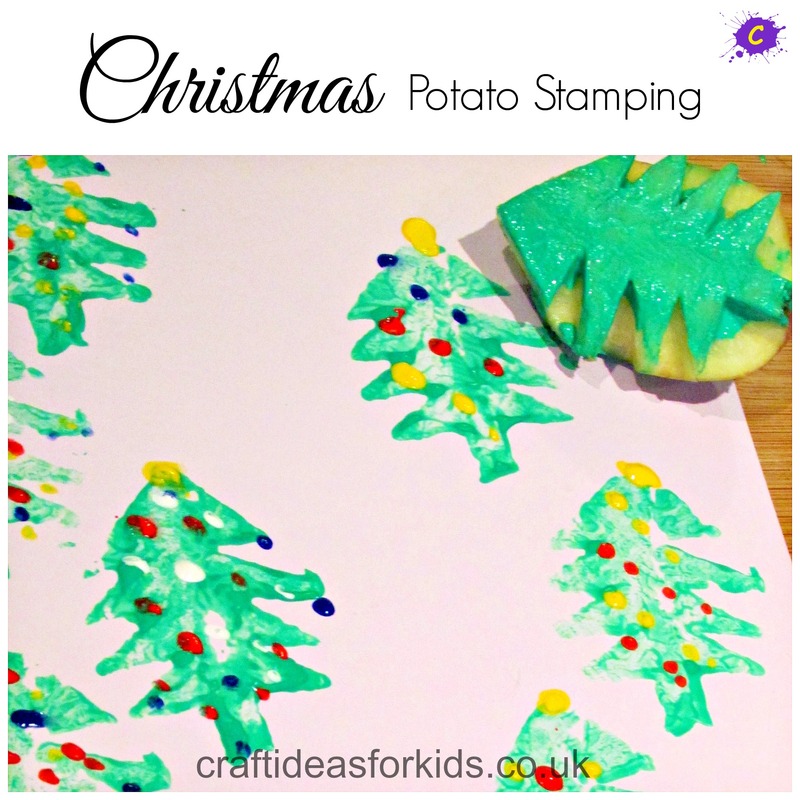 Whilst baby cakes simply slid and bashed the stamp across the paper, Little Lovely enjoyed playing and experimenting in the attempt to make the ‘perfect’ tree; they both in their own way had a blast Christmas potato stamping. 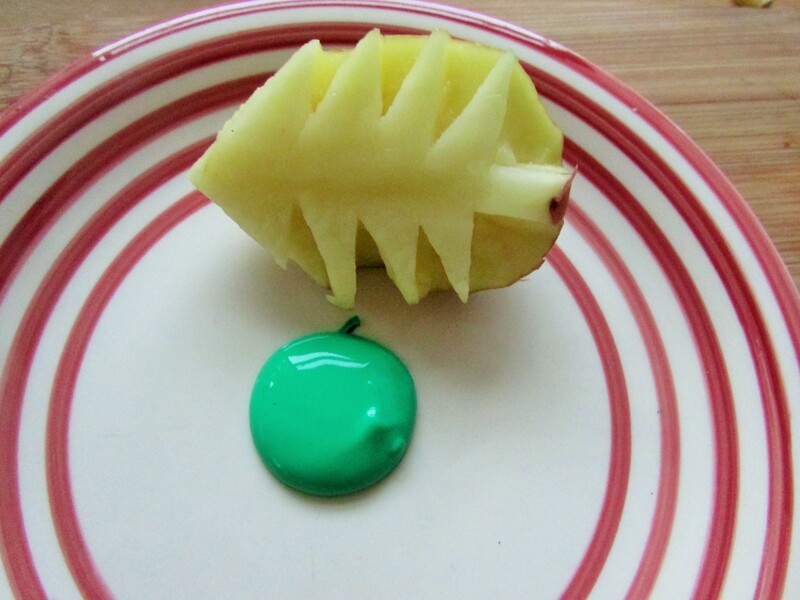 To get the kiddies going, I cut a potato in half and carefully carved a Christmas tree shape into the potato, aiming for about 1cm depth and an even ‘tree’ surface. 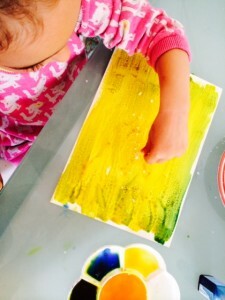 With prep complete within about 5 min, I presented the Christmas Potato stamp and paint to the Little Lovely. Little Lovely worked her way through so much paper! Applying different amounts of paint and pressure to the stamp to achieve her ‘perfect’ trees. 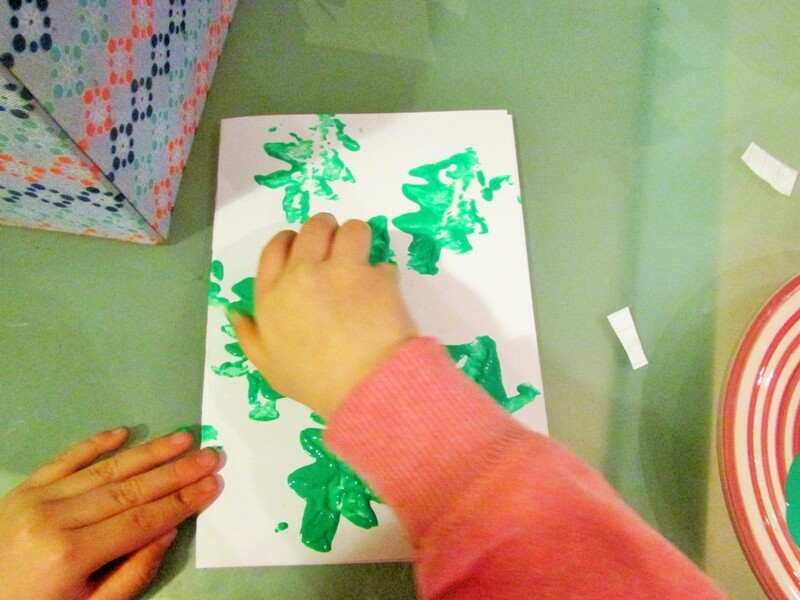 She tried fast stamping, slow stamping, dinosaur stamping with sound affects – needless to say, she had fun! With her trees perfected, they needed decorating and we swapped the Christmas Potato Stamp for cue tips. 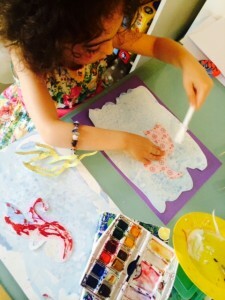 For now, Little Lovely is happy creating a simple Christmas themed painting, however this technique could be used to create cards or home-made wrapping paper! Supporting World Prematurity Day – 17th November 2014. 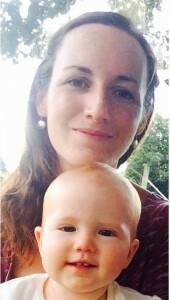 Our Little Lovely was born seven weeks premature with a condition called Tracheo Oesophageal Fistula. Within a few short hours of birth, she received life saving surgery; the scariest most uncertain moment of my life! Four years on, Little Lovely is a happy vibrant little girl and to this day, I remain in awe of her resilience and strength. 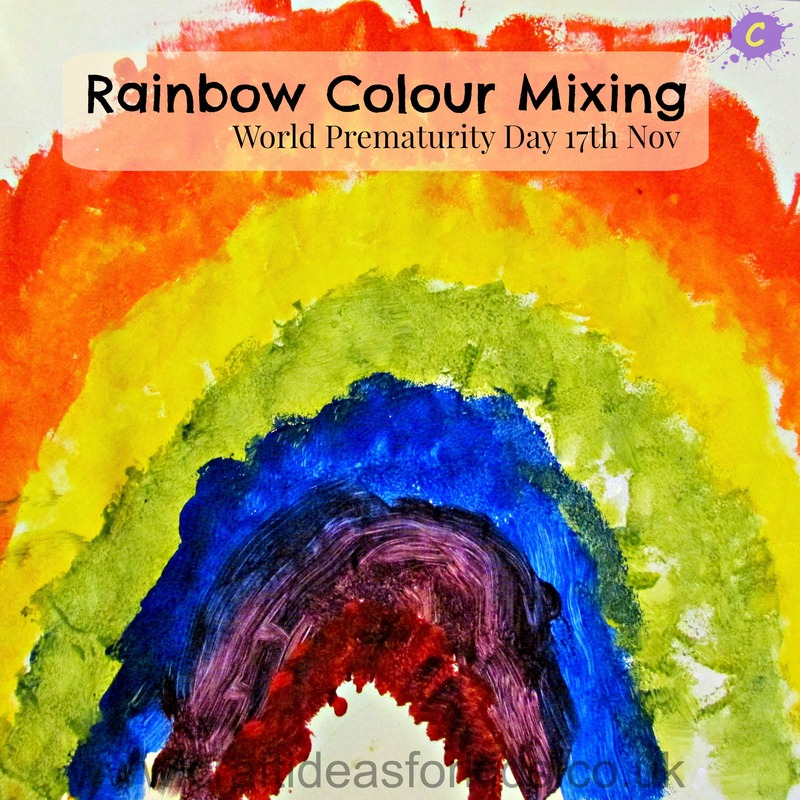 Being a colourful girl, she LOVES rainbows and I am proud to be dedicating our Rainbow Colour Mixing craft to World Prematurity Day and to the wonderful work carried out by Bliss UK. 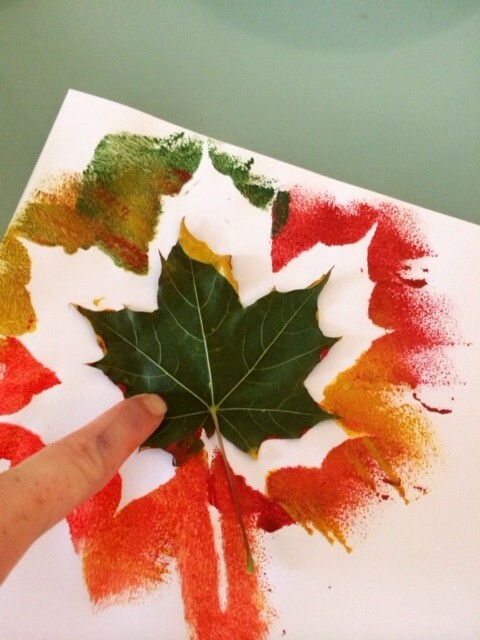 The idea behind this craft is to get crafty kids thinking about the difference between primary and secondary colours and how they can mixed to create new colours and shades. 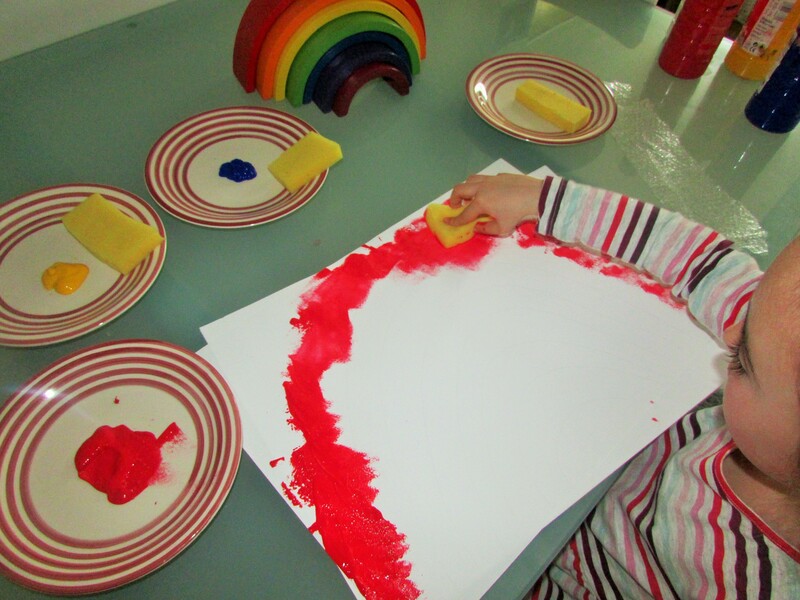 To start, I faintly drew 7 rainbow arches for Little Lovely to follow and with a sponge, she applied the first colour. I asked Little Lovely to consider how we make Orange. 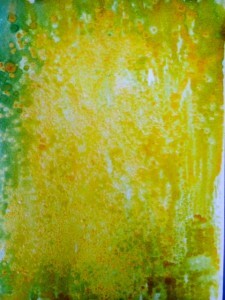 With a some experimentation and consideration, she figured it out and set to work to achieve the perfect orange. 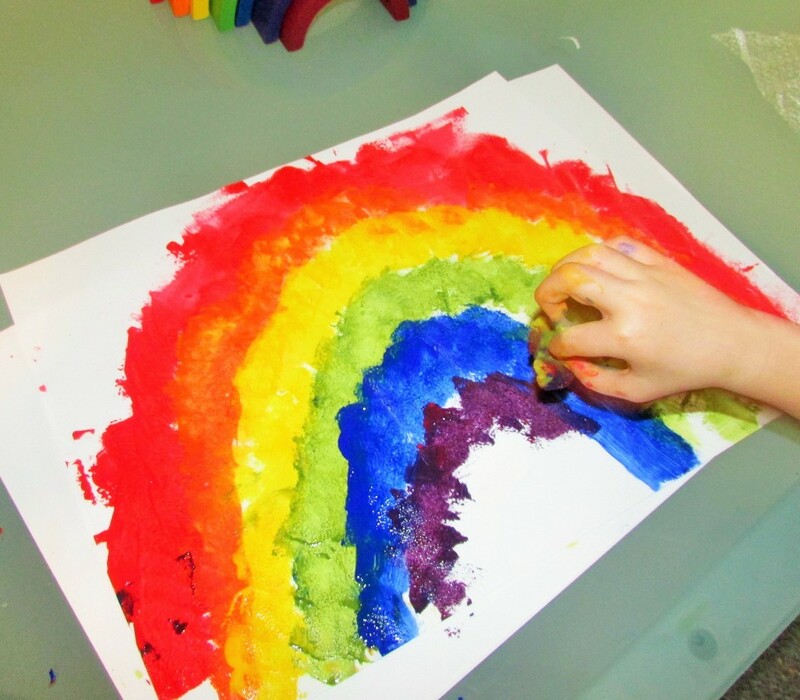 The beauty of this Rainbow Colour Mixing craft rests with its simplicity. 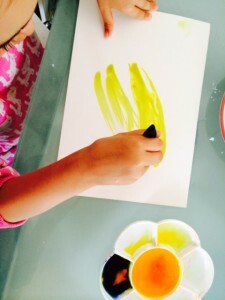 A simple painting exercise that requires a little thought, a little experimentation and leaves your crafty kids feeling proud of their beautiful work. In fact my Crafty Kid was so proud, she took hers to school for her teacher! 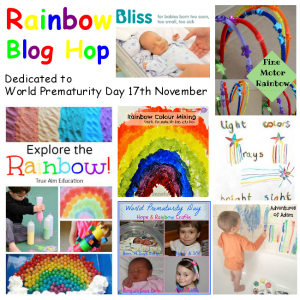 This post is part of an amazing Rainbow Blog Hop dedicated to supporting World Prematurity Day and UK based charity Bliss – who provide the best possible care and support for all premature and sick babies and their families. Remembrance day is a day of reflection and a day that remains relevant today. Unfortunately, wars are still being fought around the world and this card is intended for the loved ones left behind. A simple gesture to say “I am thinking of you, your family, the person lost and will never forget”. 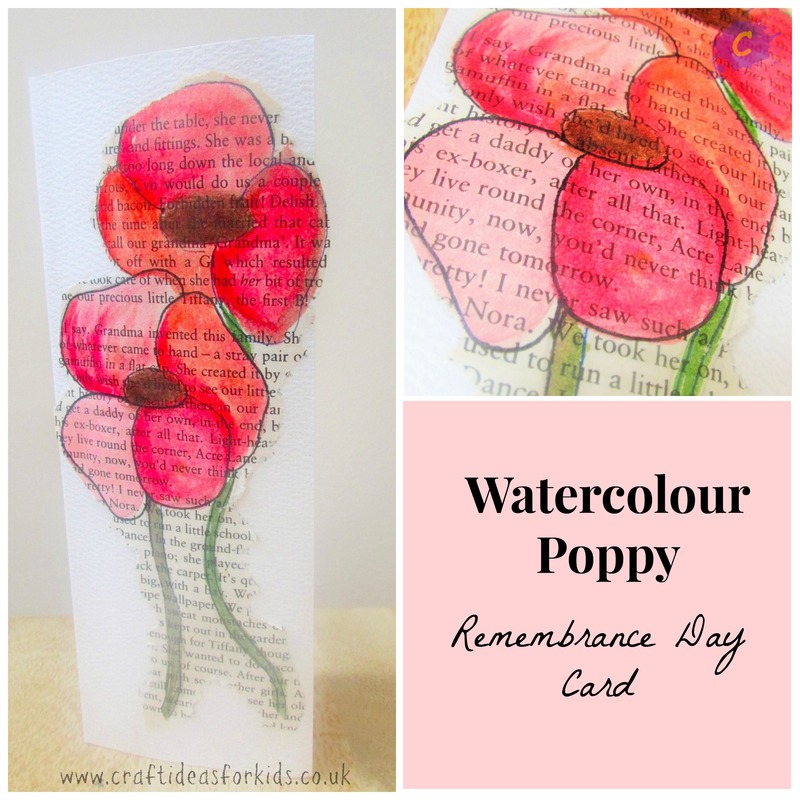 The Watercolour Poppy Remembrance Day Card is a creative way to introduce the topic of Remembrance Day to older children. 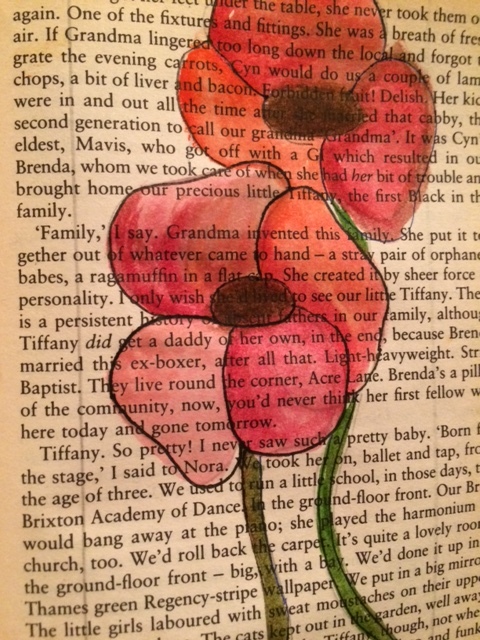 To begin, lightly draw a basic outline of a poppy onto an old page of a book and start painting. 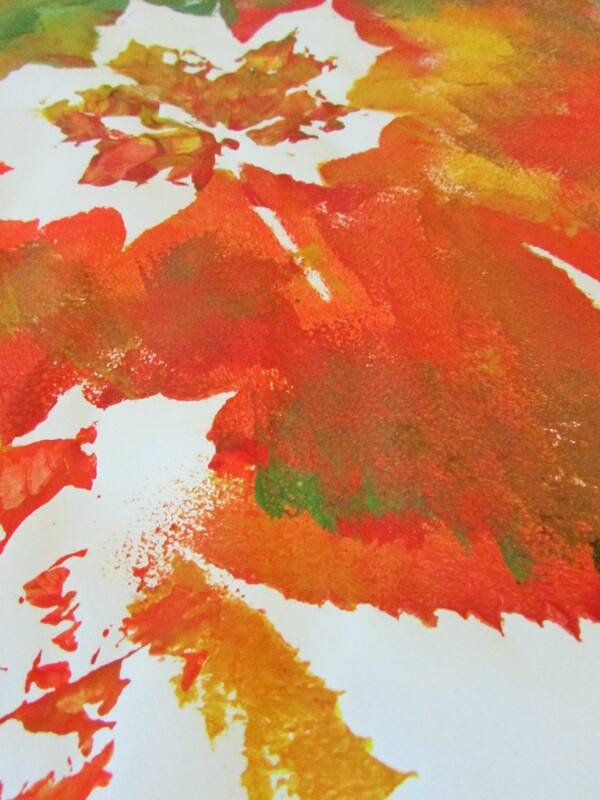 Get experimental and try merging different shades of red, pink and orange and don’t worry to much about neatness. 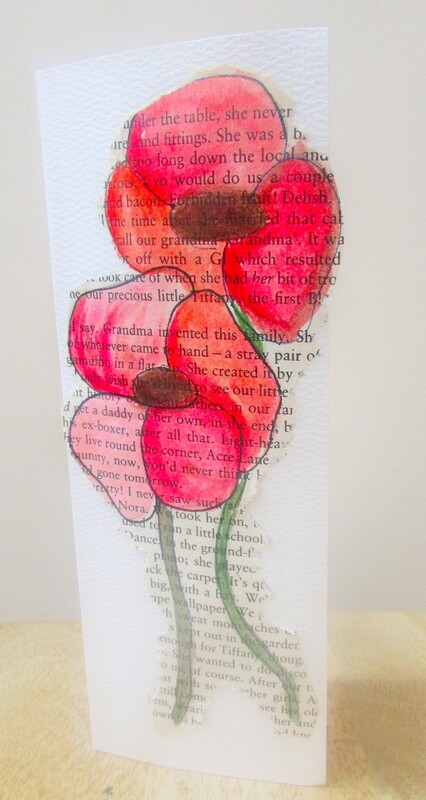 It might also be helpful to mark the parameters of the base card to ensure the poppy fits when transferred. 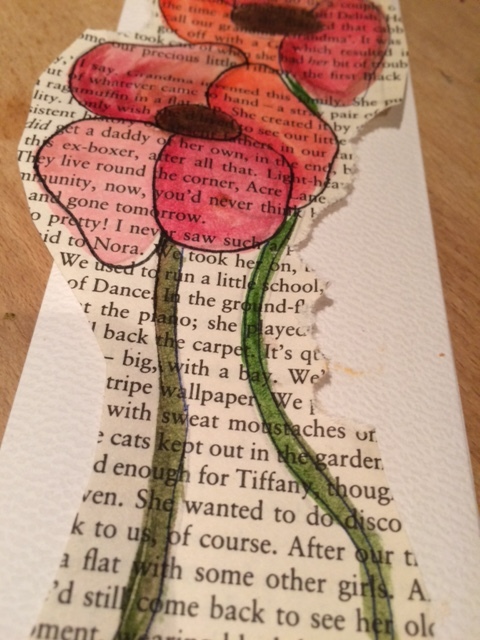 Once the painting is complete and dry, redefine the basic outline of your poppies with a fine tipped black pen. For those who are more adventurous, you could try doodling (zentangle) within the petals or stem. Next, cut around your design and ensure you leave enough room to tear some of the edges. 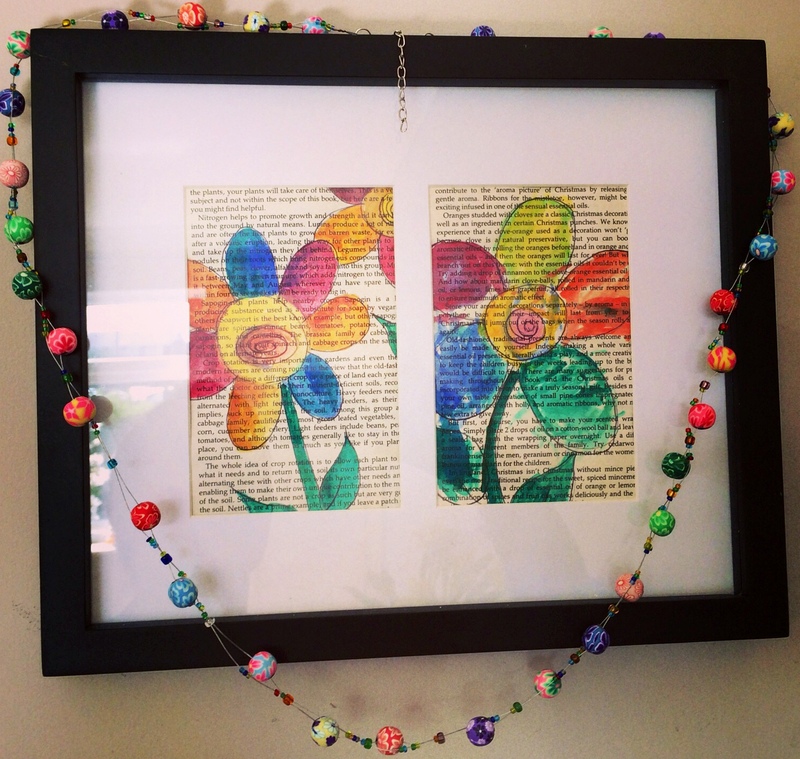 This creates a rustic feel, which I think works with this craft. Once you are happy with your picture, simply stick it onto the backing card. 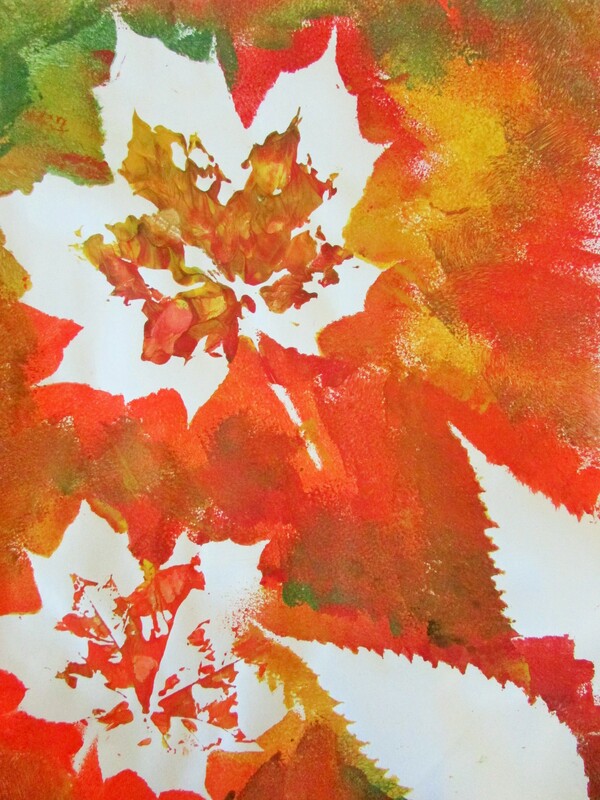 You should now be left with a gorgeous home made card to share. 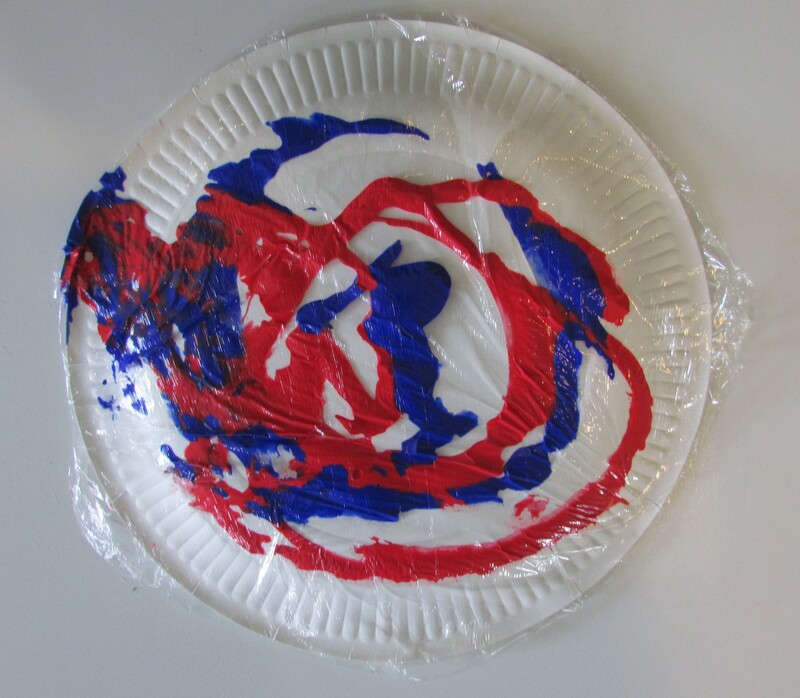 Paper plates are just amazing! 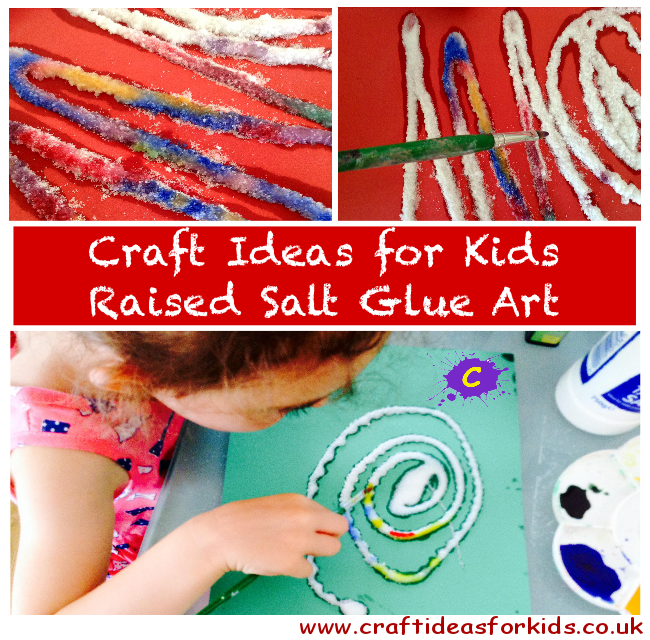 They’re easy to use, versatile and can be so much fun – a staple for every craft cupboard. 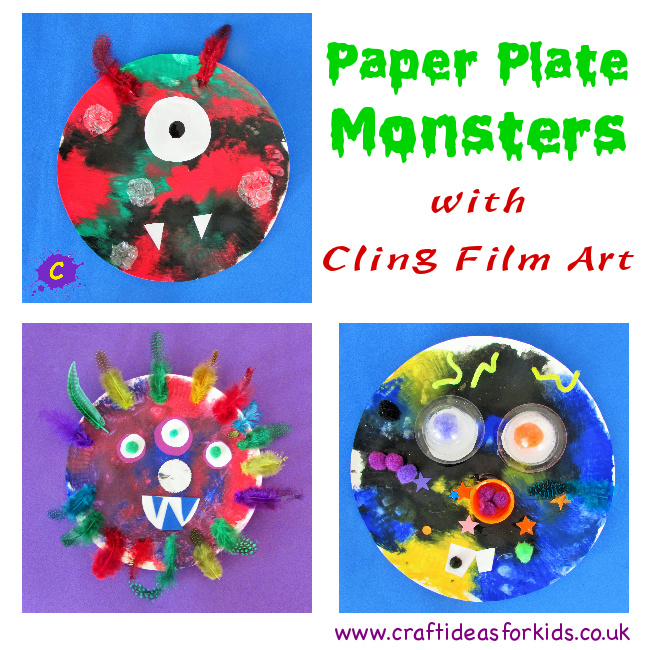 We’ve combined paper plates with our much loved Cling Film Art Technique to create these adorable Paper Plate Monsters! Olivia had such fun exploring all the random materials I keep stashed away and I simply stepped back and allowed her creativity to flow. 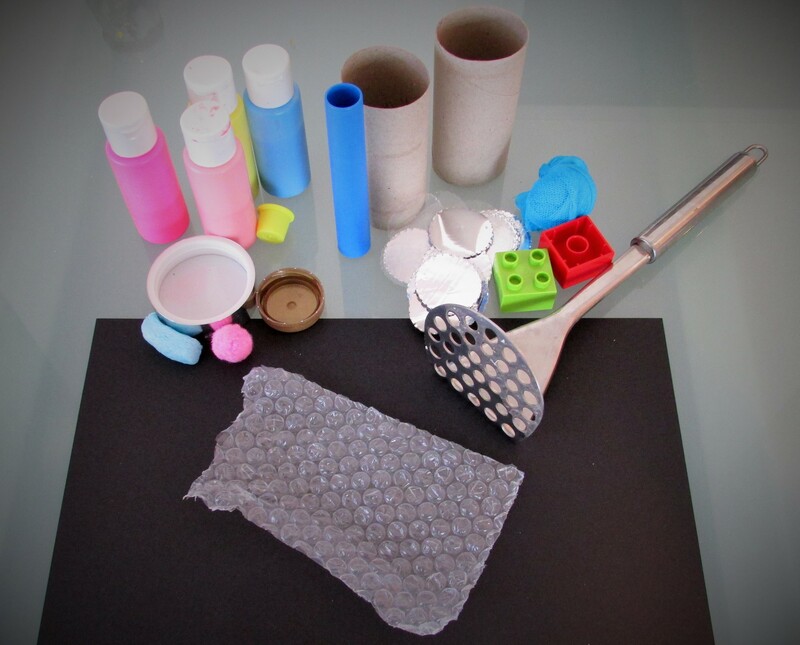 This is one of those crafts that can be easily adapted to suit the materials you have at home. 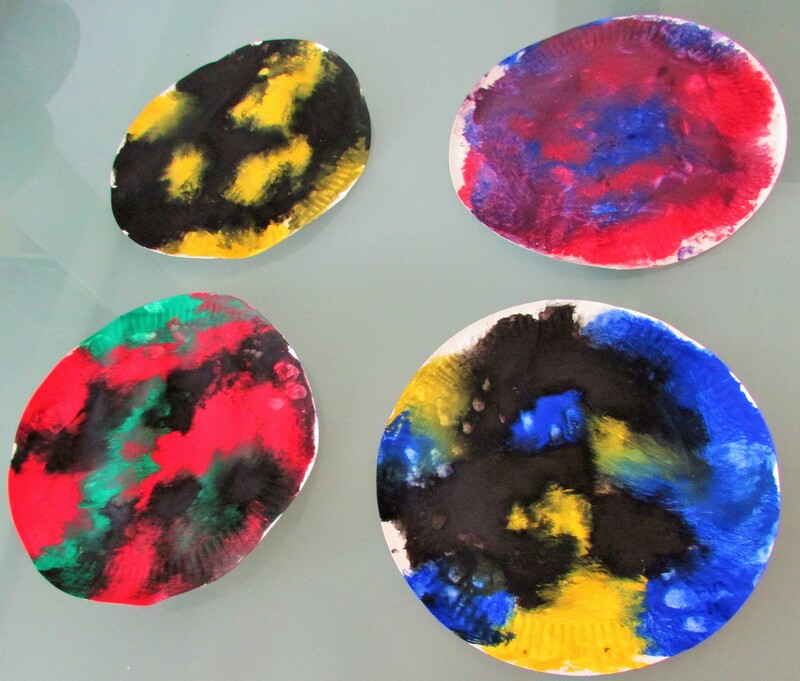 Squirt dollops of paint in various colours and directions directly onto the paper plate. 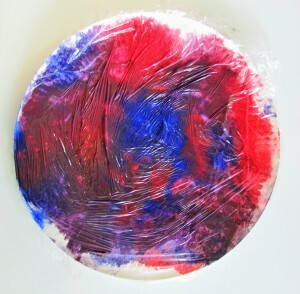 Gently cover in cling film and begin blending the colours with your hands, moving the paint across the plate until covered. This is an amazing sensory experience for little ones! 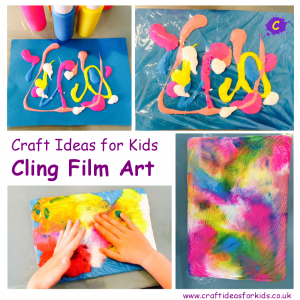 Gently peel the cling film off the plate and allow them to dry. 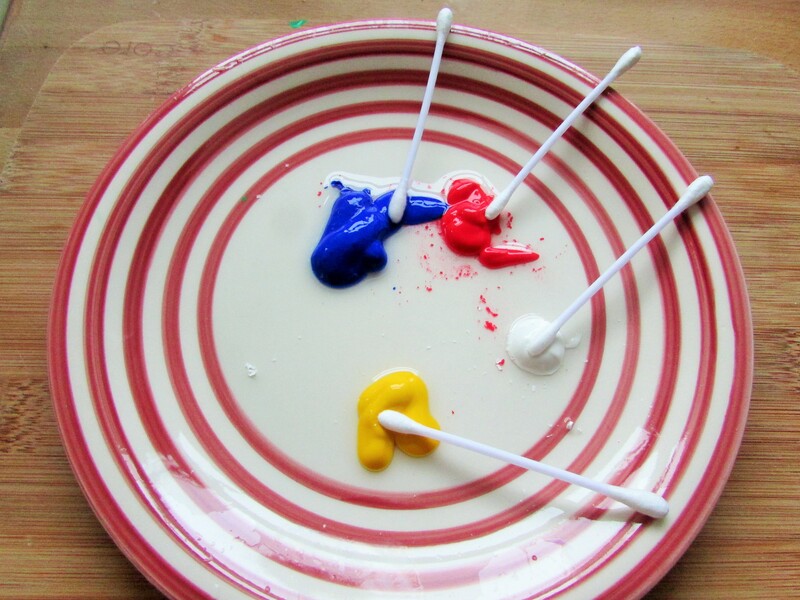 Try experimenting with different colour combinations. Olivia really enjoyed this part, especially when the colours blended to make new ones! 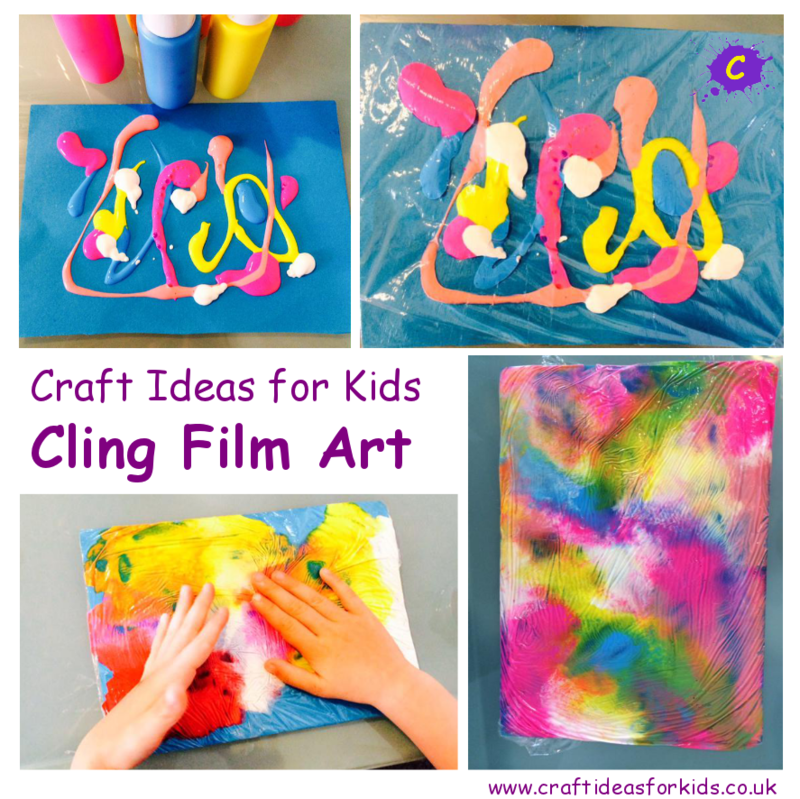 Present your crafty kiddies with a range of materials and some PVA glue, and let their imaginations do the rest! 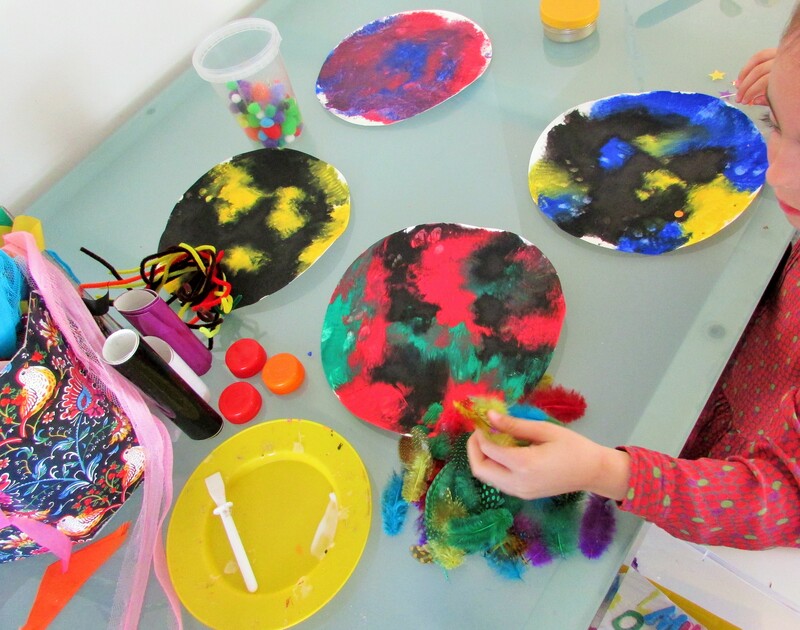 Olivia used yoghurt pots and pom-poms for eyes, bottle tops for noses, sequins and pom-poms for spots, pipe cleaners for antennae and feathers for hair. 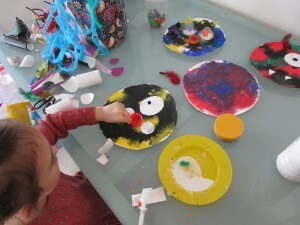 She really had so much fun making her Paper Plate Monsters and was incredibly proud of her creations. I loved watching her creativity shine! We hope your crafty kids enjoy making their Paper Plate Monsters as much as Olivia. Autumn is the season of colour and leaves. 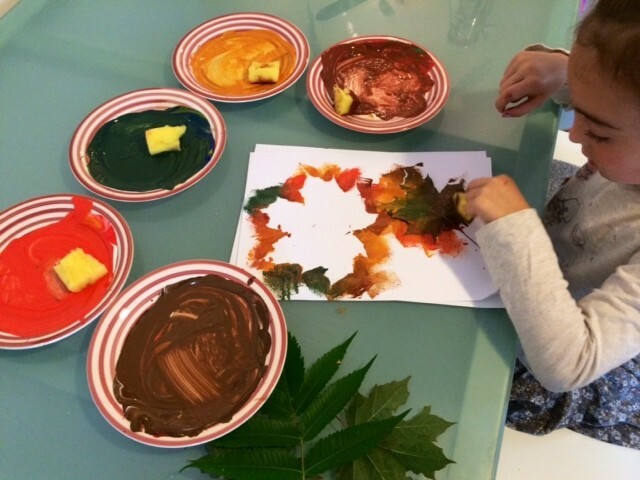 This craft is an exploration of Autumn colours and my little lovely adored mixing the paints to match the shades of our leaves; experimenting with different ratios of paint to create a range of unusual colours. 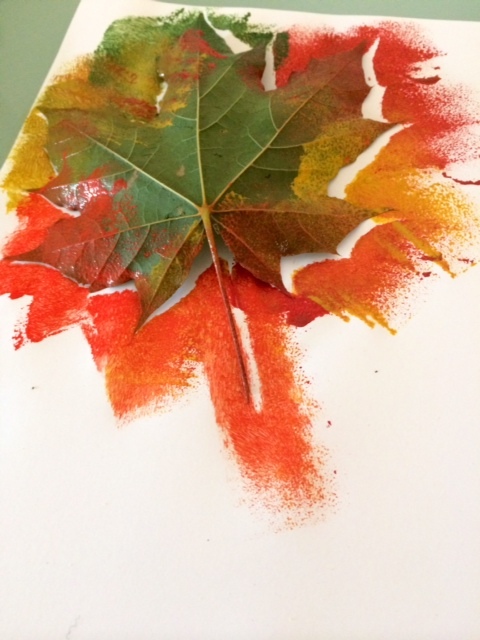 We spent time outside collecting leaves, looking at the trees to observe the seasonal change – A lovely activity in itself! 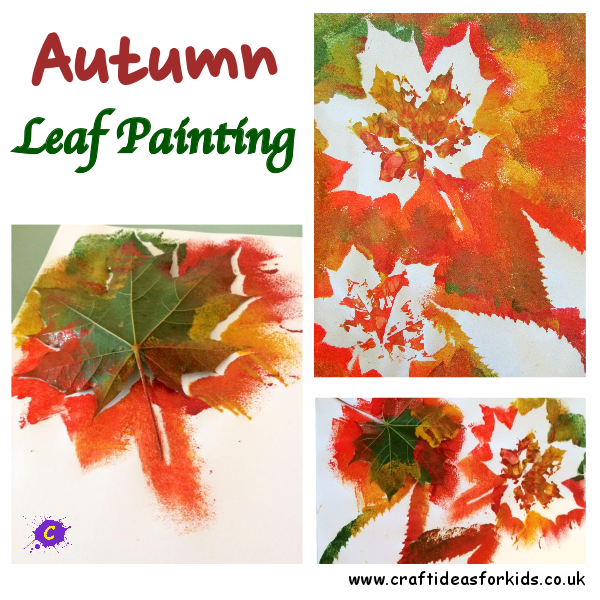 This Autumn leaf painting is designed to be simple yet effective and most of all lots and lots of fun! 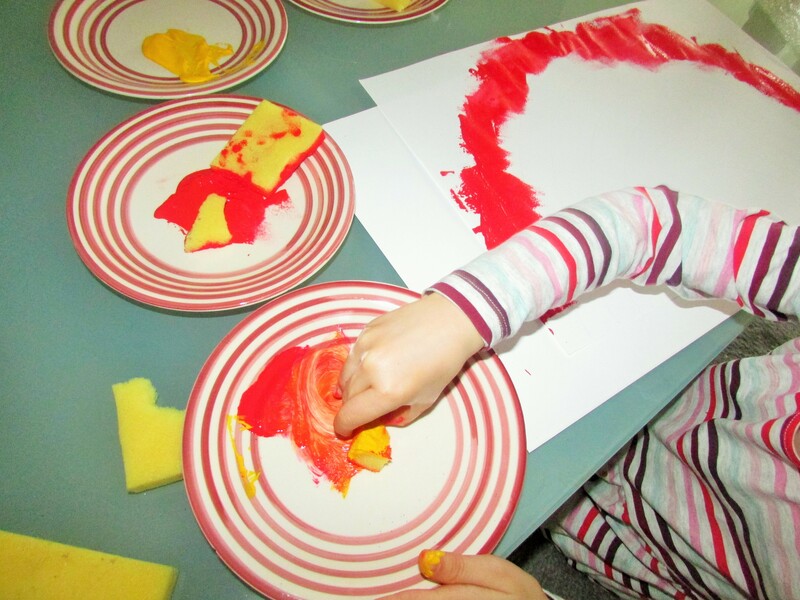 We mixed five different colours onto plates and cut up a bath sponge, dividing the pieces between the plates. Place the first leaf onto the paper and using a sponge with a small amount of paint, begin dabbing around the leaf. Encourage your crafty kid to change and layer the colours as they work around the leaf. 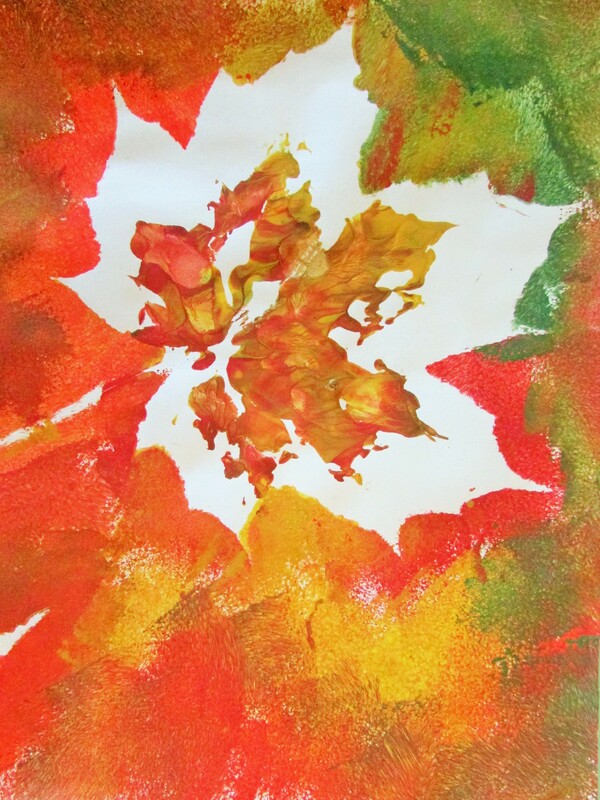 Once complete, remove the leaf to reveal the silhouette. 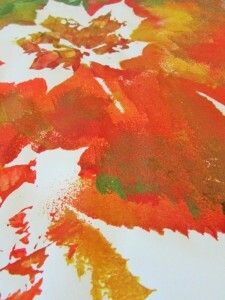 To add another dimension, we applied paint to a smaller leaf to create a print within our silhouette. 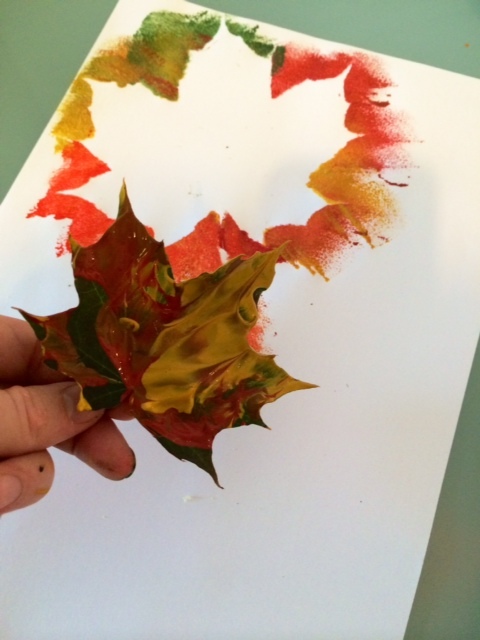 Not only are we capturing the colours in this craft, but printing with our leaves to explore their intricate forms. 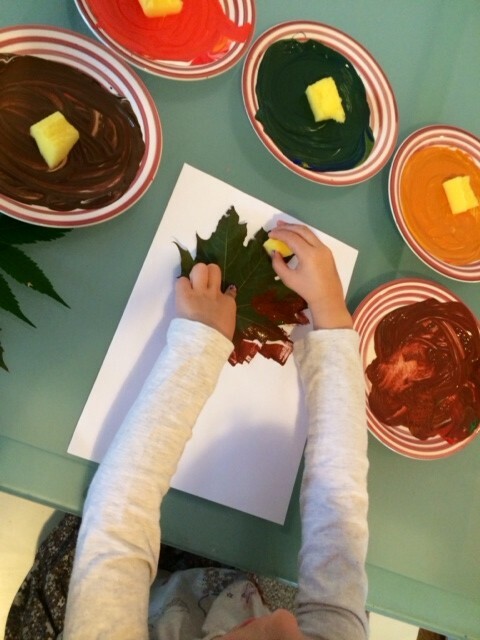 Build the picture up with more leaves, using different shapes and sizes. To complete the Autumn leaf painting, fill in the gaps between the leaves by dabbing more paint with the sponge, continuing to use the full range of colours and layering. 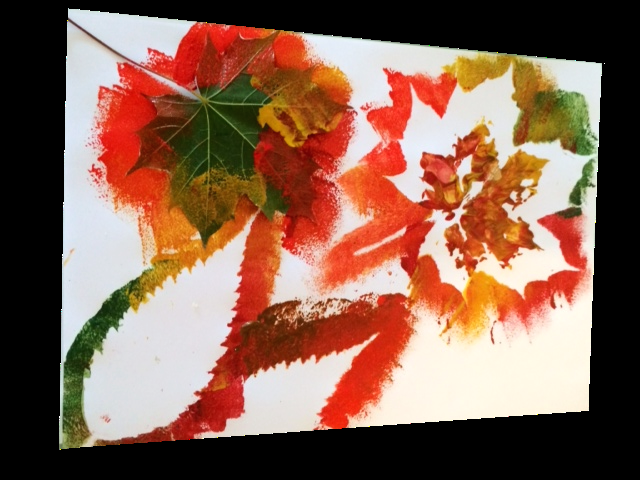 All that’s left is for your crafty kids to admire their gorgeous Autumn leaf painting masterpiece! Who knew that such magic could be made from old bottle tops and toilet rolls? 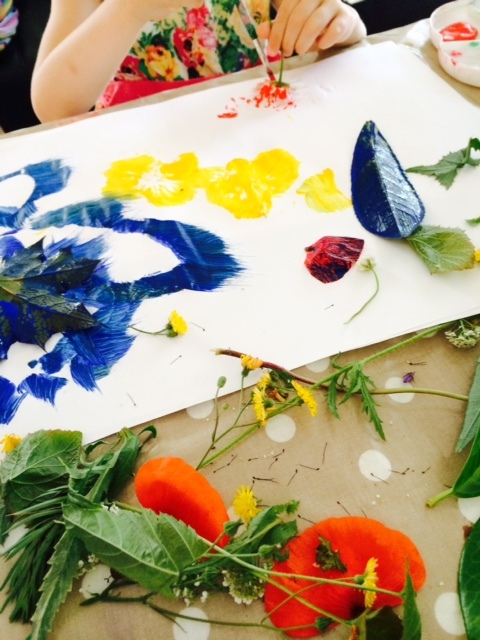 The perfect preschool craft to explore shape, colour and texture, creating a spectacular piece of art in the process! It all started with a piece of lego. Olivia noticed the circles on top, held it up and said “lets paint with this mum!”. 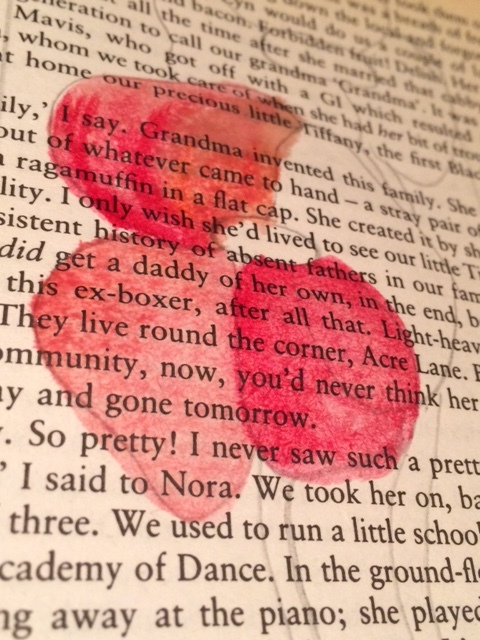 Following Olivia’s lead, a mini scavenger hunt around the house ensued looking for “circles”. 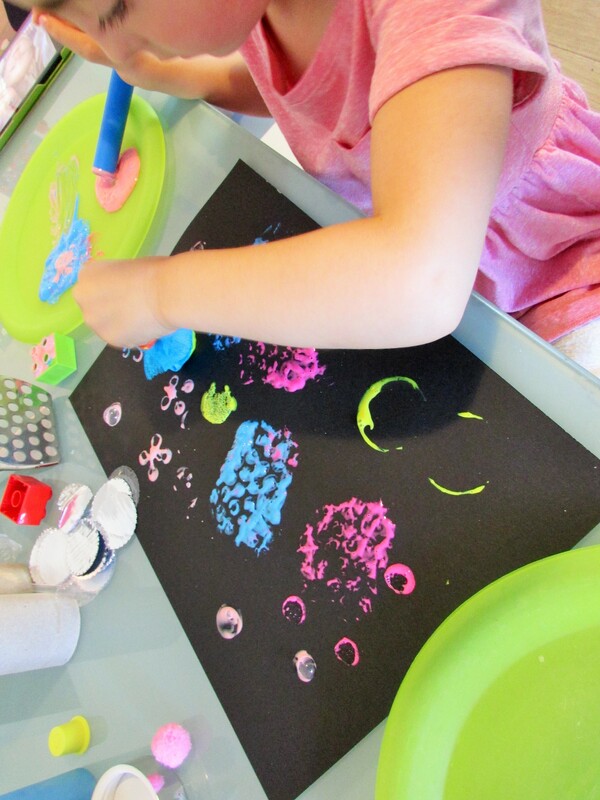 We had so much fun looking for circles and I loved how Olivia seemed to look at items with new eyes; weighing up their printing potential and thinking ‘outside the box’. 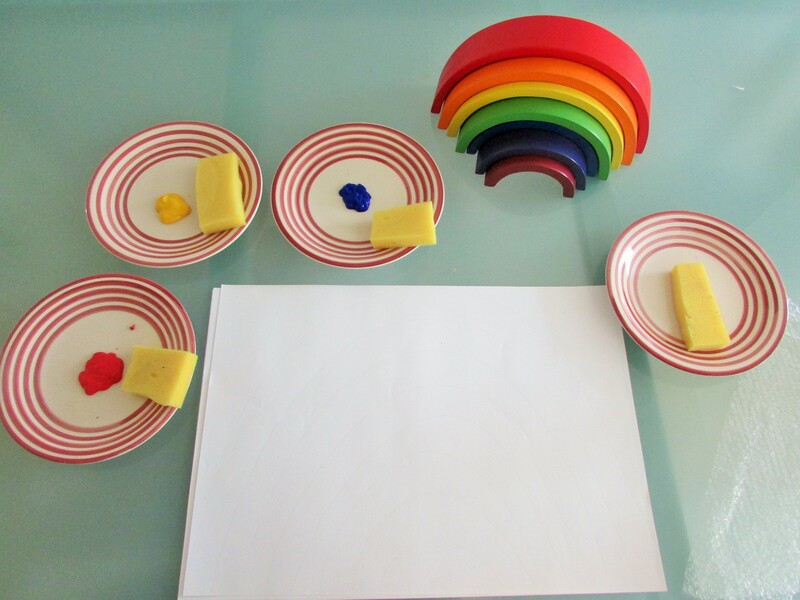 For very young children, this is a great way to introduce shapes. We soon set to work combining our circles with neon paint and black card. 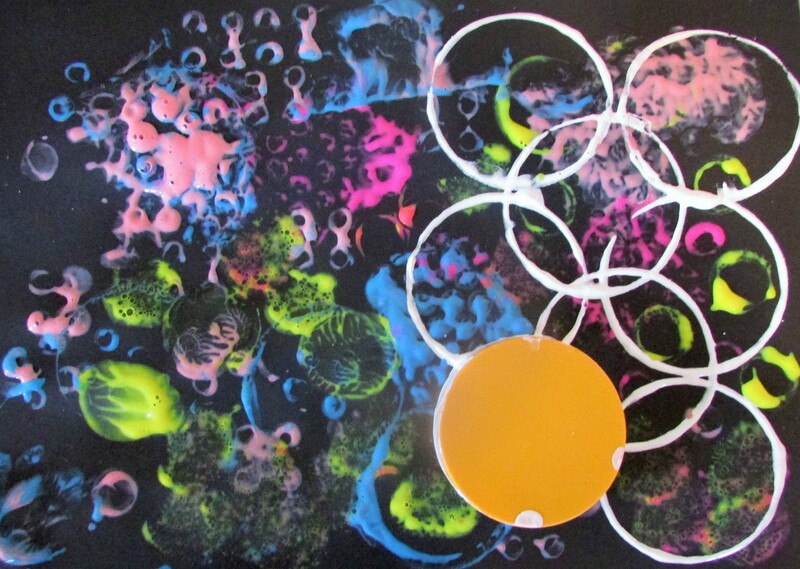 Olivia completely immersed herself into printing; exploring the range of tools, variety in textures and shapes, carefully layering the prints and colours. 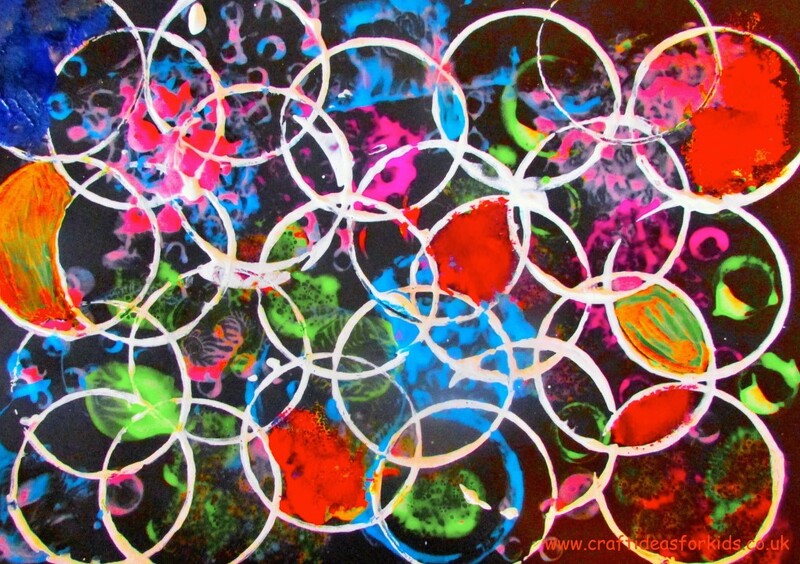 Once Olivia had finished applying the bright colours, we allowed the painting to dry before adding a layer of white large circles. I encouraged Olivia to overlap the circles to create some “interesting shapes”, filling some with colour using a paintbrush and her printing tools – A nice little hand control exercise by painting within the lines. 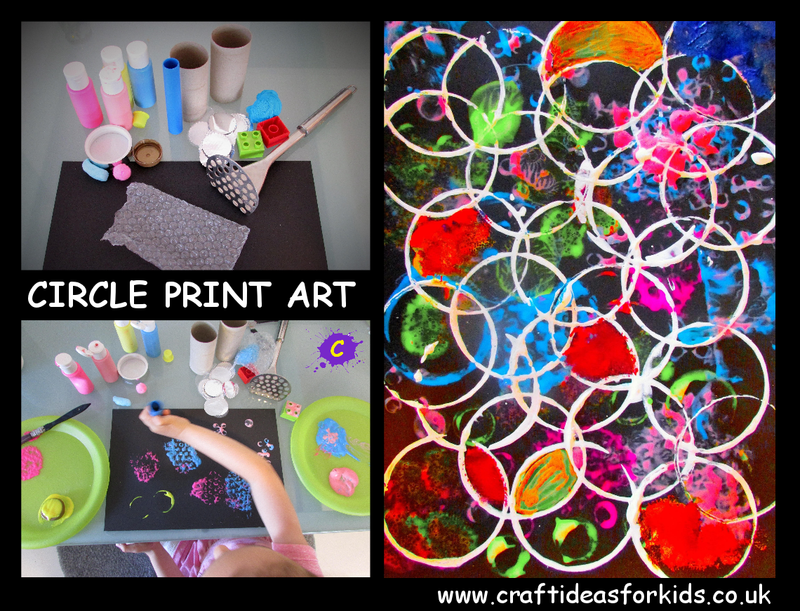 Circle Print Art is a simple concept using everyday items and a little imagination to create something very special and super funky! 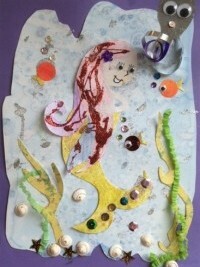 My daughter loves Julia Donaldson’s book ‘The Singing Mermaid’ and I knew when I stumbled across this craft on Mom to 2 Posh Lil Divas, that I had found the perfect medium for an underwater back drop. 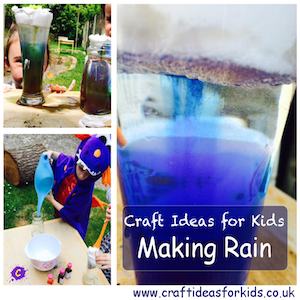 Add water to the food colouring. 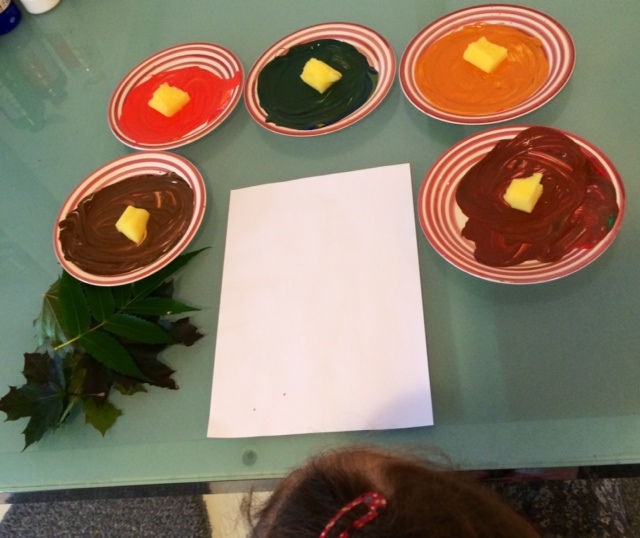 Having experimented with the water to food colouring ratio, we preferred ours to be a little thicker. 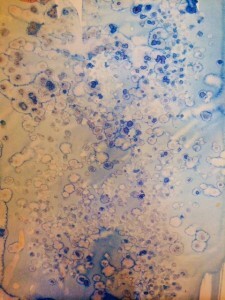 I would recommend adding a small amount first and gradually increasing until you find a suitable consistency. 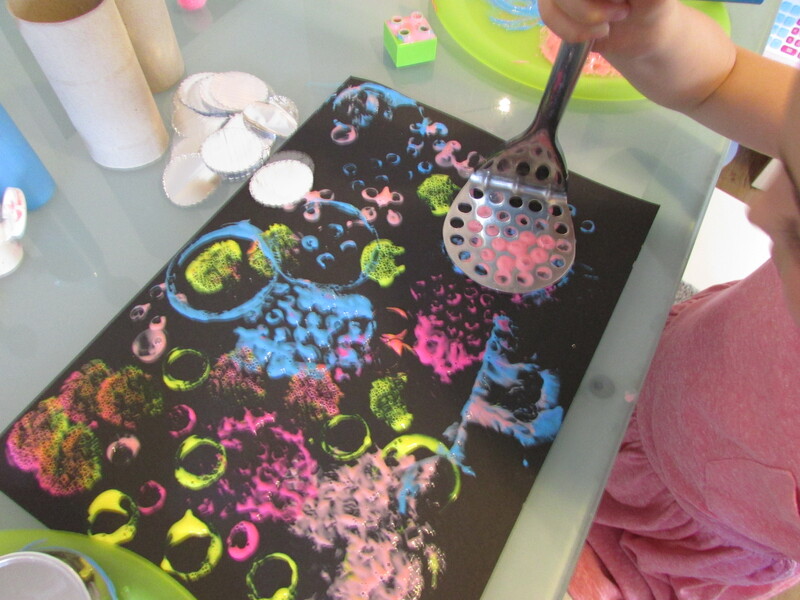 Using a thick paintbrush, begin spreading the food colouring paint over the card. 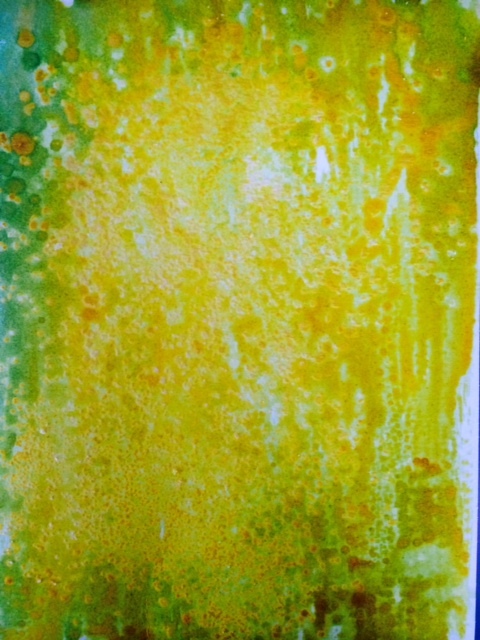 Sprinkle a generous amount of rock salt over the card whilst the paint is still wet. 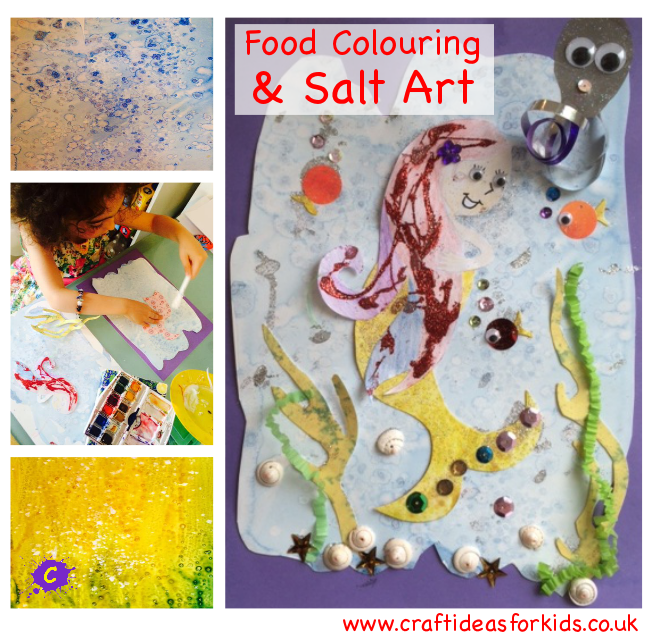 Olivia loved watching the salt absorb the food colouring and noticed the colours deepen in shade and spread. 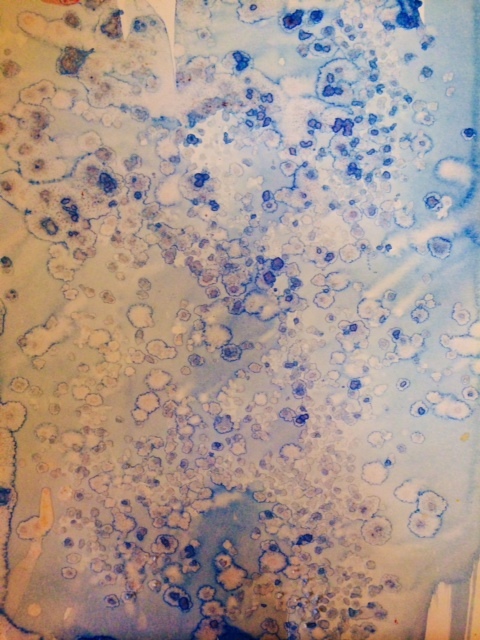 Leave the painting overnight or until completely dry and then brush off the salt. 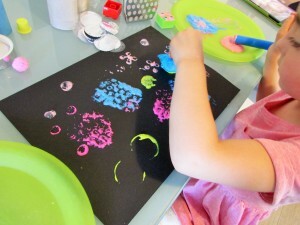 Your crafty kid should now be left with some fabulous textured paper! 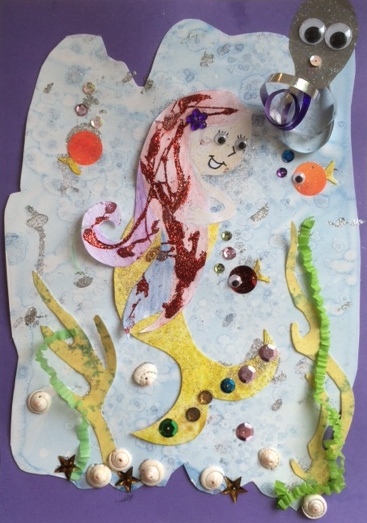 We used our paper to create an underwater scene featuring Olivia’s favourite fictional mermaid – The Singing Mermaid, finishing off with plenty of sparkles! 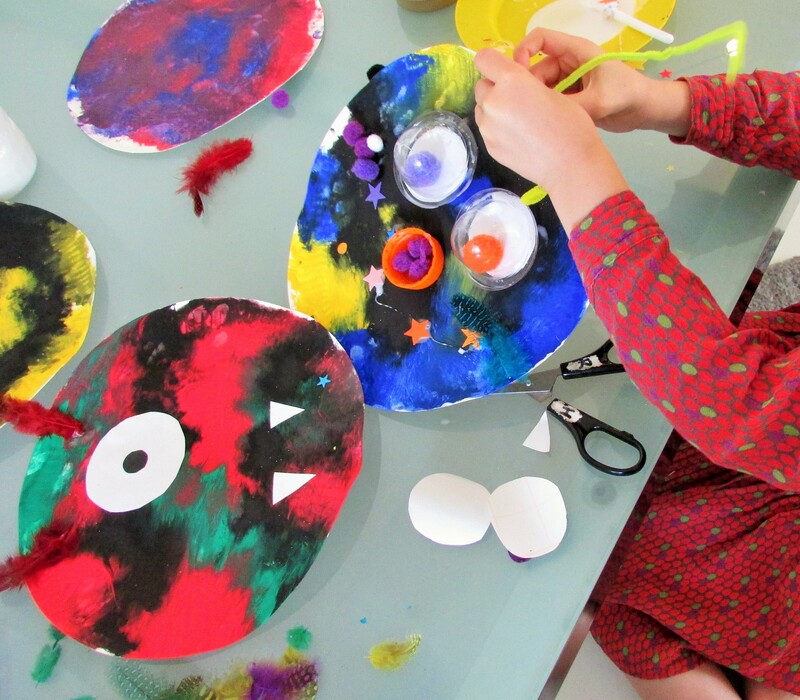 What will your crafty kid do with theirs? A section of our garden is currently full to the brim with wild flowers, showcasing various shades of reds, yellows, violets, pinks as well as orange and white – we love it! Olivia can never resist picking a daisy or dandelion as we pass.